Based on a fifty year career managing non-profit organizations and programs, I REALLY think it’s existentially important for NGOs/CSOs to collect the true costs of their operations from contracts and donors. Unfortunately, I’m not sure that Mr. Klotz’s graphic presentation is sufficiently clear that it will persuade donors. Also, read the comments at the URL just below, which are pretty smart. 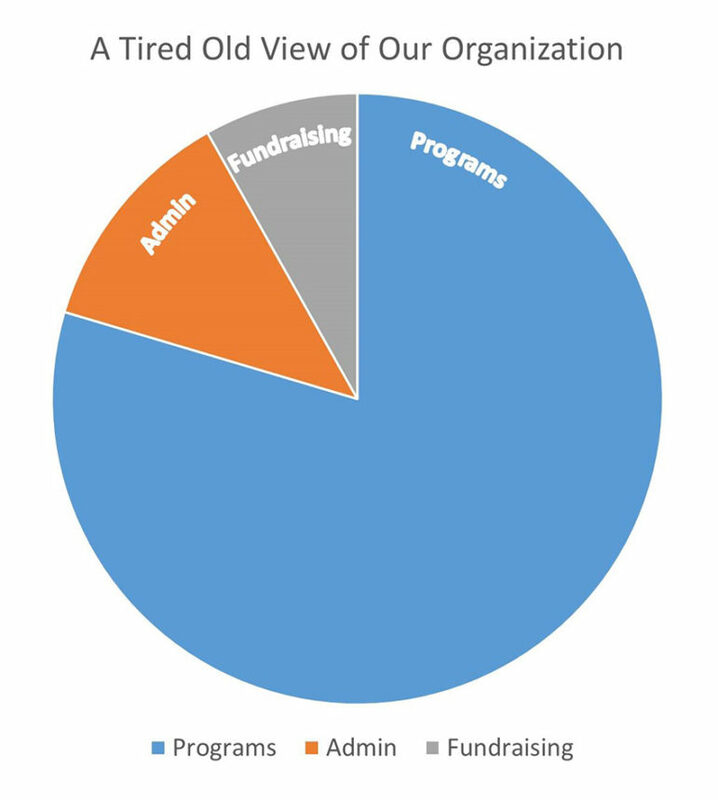 Most nonprofit leaders agree that we need a new way to communicate about the true costs of our programs and the vital importance of strong organizational infrastructure. But we have not yet developed a simple, consistent message when sharing our view with potential supporters and investors. We are stuck with old terms and old images. The following series of images and descriptions is really a blog in pictures. 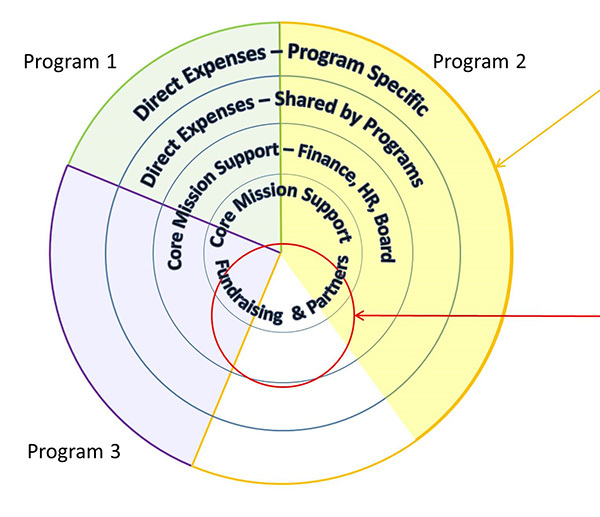 How we visualize our understanding of nonprofit structure and programs shapes the overhead debate. It’s time to get graphic about our new ideas—to deploy fresh images to help educate the public, our funders, and ourselves. 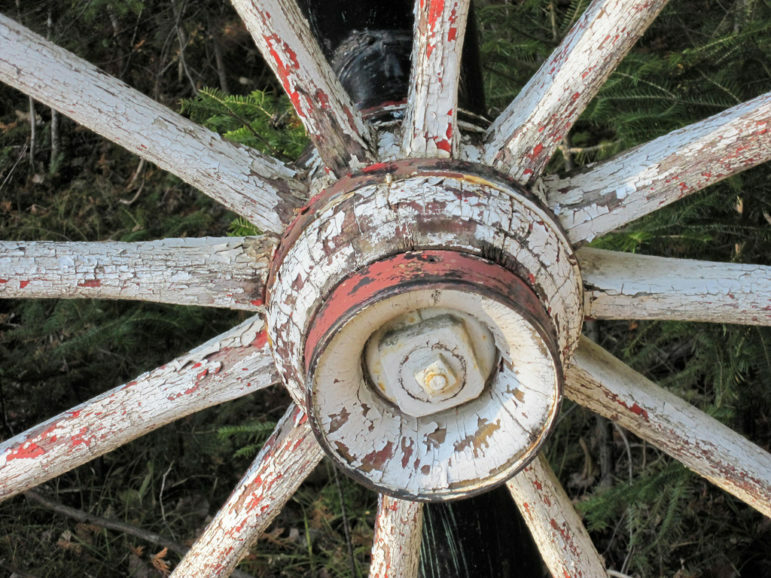 When nonprofits are viewed this way, no matter how hard we try to think differently, we imagine important infrastructure of our organization as taking a slice out of the pie—as diminishing the “real” work of our mission. Strategic financial functions, good governance, and the development of key funding partnerships are vital to strong organizations. We need a new way to communicate this truth. Some programs are only partially funded by contributions or by earned revenue. 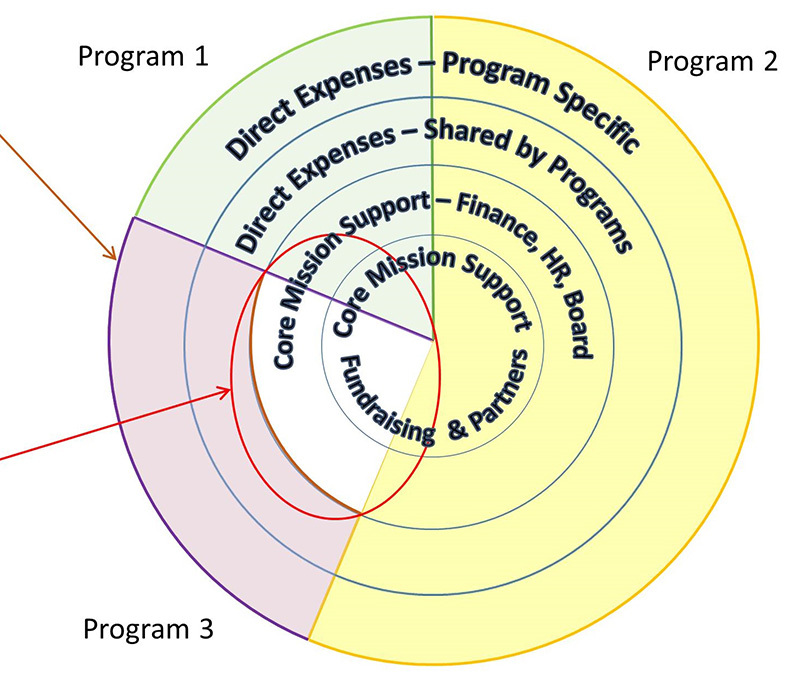 When a program is only partially funded, the expenses not covered include a proportionate share of the Core Mission Support. This creates a Gap in funding for the finance, human resources, governance, and fundraising infrastructure that support the entire organization. 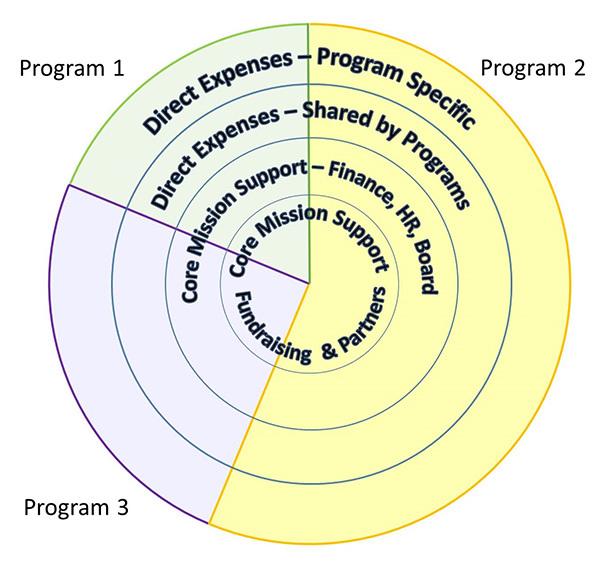 Some funders limit their support to only the direct expenses of program. 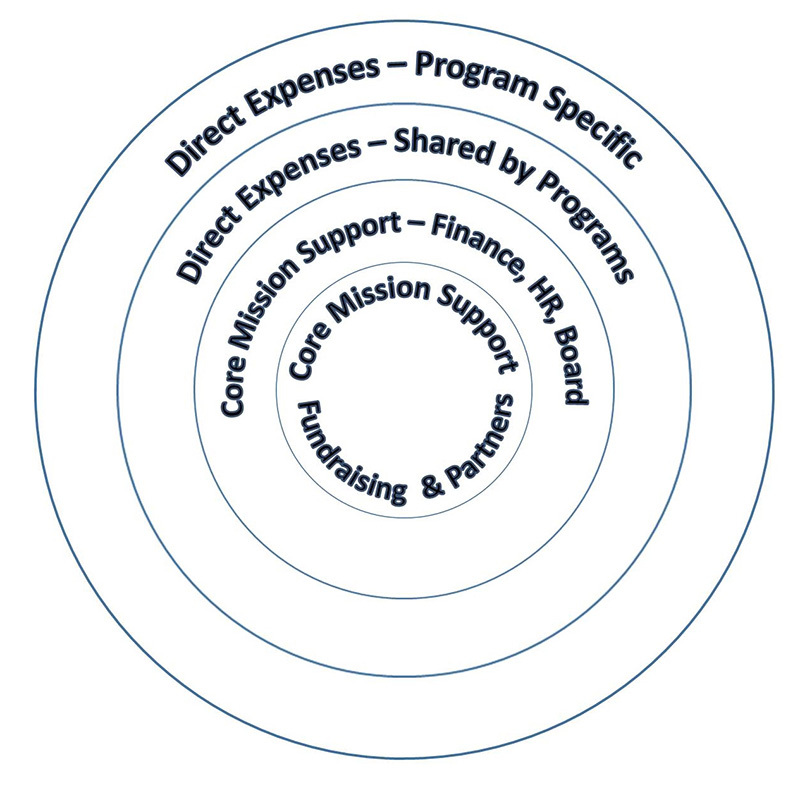 When funders support only direct expenses, they deny funding for Core Mission Support. This leaves a Gap at the center of our organization. Not only is one program affected, but the health of the entire organization is at risk. The growth and effectiveness of our mission work depend on having a solid core at the center of our organizations. Investing in our infrastructure is savvy, prudent, and absolutely necessary. Once we have a new way of understanding and communicating about the Core Mission Support needed by our organizations, it is our job to share our thinking with others. Our funders, supporters and investors all want us to succeed. They are partners in accomplishing our mission work. But like us, they may need help reimagining the role strong infrastructure plays in amplifying program effectiveness. 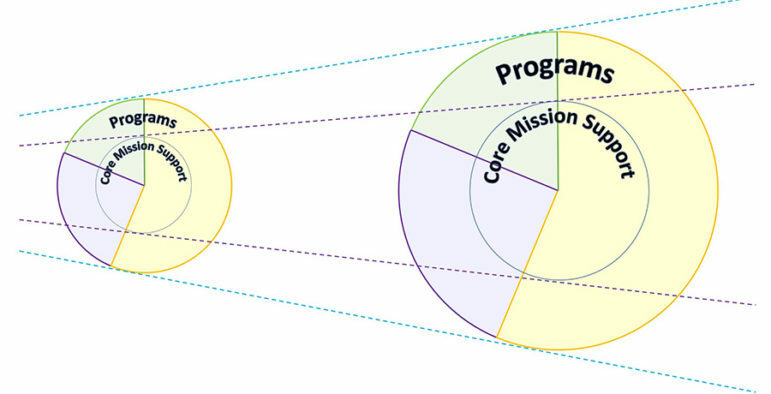 By providing a simple visual guide, we can help transform the way we talk about, picture, and ultimately fund the Core Mission Support that is at the center of all great nonprofits. This article was published in its original form at the blog of the Nonprofit Assistance Fund. Curtis Klotz is the CFO and Vice President of Finance at Propel Nonprofits, a certified Community Development Financial Institution in Minneapolis with the mission of fueling the impact and effectiveness of nonprofits. In his current role, he also provides financial management advice and support to a variety of nonprofits, is a frequent presenter at conferences and workshops on nonprofit finance topics, and is a frequent contributor to Propel Nonprofits’ Balancing the Mission Checkbook blog.